I use the containers for storing leftovers and for bringing cookies to shutins. I use the bags for freezing. I often wonder what we did before baskets and ziploc bags! We keep everything from Polly Pocket pieces to sliced apples for lunches in ours! Besides for storing food we love to use them with our boardgames to hold all the little pieces. 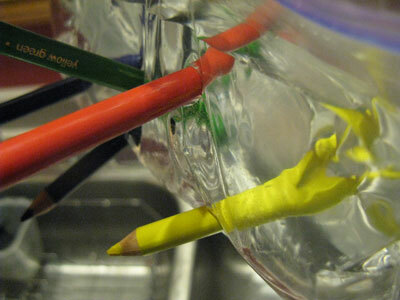 I use Ziploc bags to organize crayons, marinate...etc. I use the bags for leftovers, storing baked goods to keep them fresh, for toiletries when traveling and when someone needs to leave a tooth for the toothfairy it is always in a ziploc bag. I use them for my husband's lunches and my kids toys! I use the freezer bags for everything that goes in the freezer, I use the other bags for storing leftovers, cooking, I have even used them to frost cupcakes. We use Ziploc baggies for keeping up with Barbie shoes and other small doll accesories. I use Ziploc bags and containers to store leftovers. I use them to carry snacks for on the go. I used them to store pumped breast milk. I'd first freeze it covered ice cube trays, pop them out and put them in labeled Ziploc bags. I use the larger bags to make our own Ice Packs. I use bags for Lego sets, very convinient! We use them for freezer jam and lunches. We use them for storing things when we travel, like jewelry, q-tips, etc. We also use them for boardgame pieces to keep them all together. I use my Ziplocs for food storage, travel(toiletries), and for sending stuff to school for my daughter. I use Ziplocs most frequently in lunches and marinading meats. I use Zip Lock bags to store hamburger patties. I pack two to a bag with wax paper between and then use a larger bag to hold the individual bags in the freezer. I use freezer Zip Lock bags to hold veggies I am freezing from our veggie garden. I use baggies most often for storing cheeses in the fridge. I mainly use them for food storage. One of my favorite uses of the snack size bags is when I work on needlecraft projects I give each color its own bag. It avoids tangles and since I also label them I don't have to remember which color is which. I use zip lock bags to keep leftovers in to freeze in to put snacks in for the girls. Thank you for the giveaway. We use Zip Loc bags for so many things but, one of our favorite ways to use them is making homemade ice cream for treats. Tightly close the quart size zip loc and place into the gallon bag of ice/salt mixture. Zip the gallon sized bag closed with most of the air let out. Finally, shake the bags until ice cream forms! It's delicious, try it! My kids love making this. I use both Ziploc bags and containers in the classroom mainly for storage. I use them to keep all of the colored pencils, the protractors, the compasses, overhead projectors models, etc. together and thus easier to find and to make certain that all have been returned before class ends. I have used the containers to teach my students estimation skills by filling them with different sizes of various things. 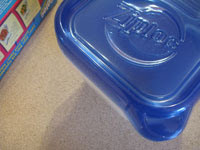 I use Ziploc containers for storing food in both the refrigerator and freezer. I use the bags for school lunches, annd for storing food. I take a few of the large one with me on vacations to put our wet and/or dirty clothes in. I use the large Ziploc bags for storing out of season clothes. At school I use snack size ziploc bags to bundle up my Box Tops for Education. At home we use ziploc bags mostly for food storage. We use the gallon and quart bags for freezing. The small canisters for sending in lunches and the really large totes for toys. I use the containers for leftovers, and they are forever disappearing. I use ziplock for all my left-over storage--and I freeze all my vegetables from the garden in the freezer bags. I use them for storing food leftovers, small tool sets and coins. I use Ziploc bags for the kids school lunch every day. I use ziplock bags to make my own individual portion snacks for lunches. I use ziploc bags for storing leftovers and produce, freezing homemade bake goods, packing lunches. 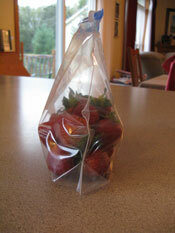 I use ziploc bags for storing leftovers, freezing bread, fruit, meats, and other bulk items. Keeping food in the freezer and for lunchbox! We use ziploc freezer bags all the time for leftovers. I think being able to freeze food saves us a ton of money on groceries. It's definitely worth buying ziploc brand freezer bags for that. I used Ziploc bags for food and craft storage. I use Ziploc storage bags and containers constantly in my art studio. Thank you for the lovely giveaway. I use Ziploc to freeze everything. It helps to prevent freezer burn! I use Ziploc bags to store everything from extra foods, toys, and school supplies. This is going to sound awful --but I use ziploc bags in my car--in fact the seat pockets are full of them. We visit my parents at least one a month, and when we do we have to drive at a high altitude, on several very windy and narrow roads. My kids get car sick--almost every time and there is nowhere to pull over so I give them each a ziploc bag and when they throw up they just zip it up quick (to try and avoid a chain reaction)--they are so good about it then I take the bag until we hit the first trash stop--and I get rid of it. We try taking them when they are asleep--nothing is worse then a toddler throwing up in their sleep--all over themselves and their siblings.We have tried everything they wear motion sickness bracelets --which actually help quite a bit--but still every visit at least one will throw up either on the way up or the way home. Our Doctor thinks it's the combination of motion sickness--with the high altitude. The ziploc bags are actually a life saver because before we used them they would throw up in a bag--but then the smell would cause the dreaded chain reaction. We use them a lot, I always have one in my purse, just in case I need to store something wet/dirty/gross. Use to freeze and store food in the kitchen and to keep puzzle pieces together in the playroom. I use them for just about everything. Right now, I'm putting away my sons' Lego collection for their kids. The 2 gallon size are perfect for putting the whole model in without having to take them apart and this way all of the pieces stay together. we use them for everything,meat,pens,extra parts for toys. I used one yesterday to pipe egg yolk mixture into deviled eggs, and another to drizzle glaze on brownies. We use them for storing leftovers. We pack lunches in them, store veggies in the freezer..etc. We use them daily in lunches as well as for food storage in the fridge and freezer both. I use ziploc products for the obvious - food storage! But I love their bags to help organize my beads too! Some bead sellers put their beads into little bags that they staple at the top - that's find as long as the bag isn't opened, but once it's opened there is nothing to keep the beads in there. So I like to put those little open bags in a snack size ziploc bag where I know they will be safe & secure! I used them to store small items, for freezing food, to store left overs. I use them to store leftovers! 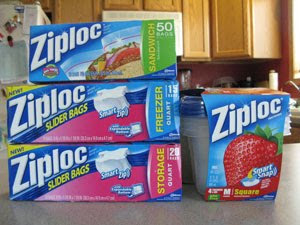 I use Ziploc products on a daily basis, I love them! I use them for leftovers, taking stuff with me when I travel, the kids lunches, and on and on! We use them for the usual (storing food. However, they are great for trip to pack toothpaste and toothbrushes, crayons, etc... They also make great ice packs for ouchies! I use Ziploc bags for just about anything. I use the snack size to package a serving of cookies for my husband's lunch. I use the large sizes for traveling to contain liquids in case of a spill. Thanks for the giveaway...we use Ziploc bags & storage containers for food storage mostly, although one of my daughters uses a container to grow flowers in her bedroom ! I use Ziploc bags to take things with us in the car. Place a wet washrag in the bag then if you need to clean up on a trip it's right there!! !